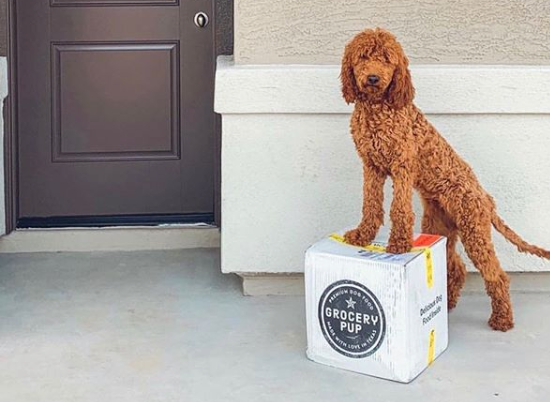 A new startup called Grocery Pup is bringing freshly cooked meals—for your dog—right to your doorstep. Billed as the “tastiest and most nutrient-rich cooked dog food,” Grocery Pup uses sous-vide cooking to achieve what it claims is the highest quality, human-grade, and most convenient dog food around. Shoppers can buy products on a one-time basis or opt for a subscription method like human-focused meal kits. The subscriptions are based on the dog’s weight for proper portion control. Using the sous-vide cooking method, Austin, Texas-based Grocery Pup fills BPA-free vacuum-sealed bags with high-quality raw ingredients rather than livestock-grade feed. The brand adds that sous-vide cooking method is also helpful at keeping the food from drying out. According to the website, Grocery Pup is also selling its doggy meals at certain brick-and-mortar pet stores as well as same-day delivery through Jet.com.